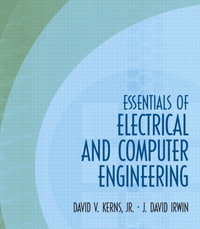 Essentials of Electrical and Computer Engineering 1 Edition With sound, practically-oriented coverage of all the basic concepts in electrical engineering, the second edition of this book represents the best balanced general introduction to the field available. It superbly integrates conceptual discussions with current, relevant technological applications. This text clearly presents the fundamentals in the context of various applications from all engineering fields. It also introduces and utilizes the latest technologies to illustrate how modern technologies are interdisciplinary. Chapter topics include circuits, transient analysis, steady state power analysis, operational amplifiers, and more. For anyone who wants to use a self-study approach to learn the fundamentals of electrical engineering.